The Honda Fit has always been an appealing urban runabout, with its tidy size, voluminous interior, amazing versatility, and good fuel economy. The 2019 Honda Fit is no different. With four models to choose from, the Fit has something to offer for anyone in the market for a small, nimble, and economical commuter. 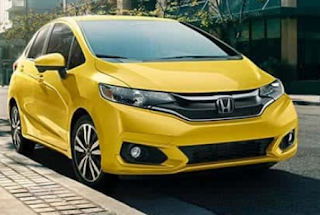 From the base model LX, to the fully appointed EX-L Honda Fit, each trim level builds upon the one before it, giving you more features and upgrades as you go. With the LX you get features like multi-angle rearview camera, 6-speed manual transmission, and 2nd row Magic Seat. For the Sport version, you get add-ons like 16” alloy wheels, 7” display, and available paddle shifters. Added to the EX model are one-touch power moonroof, Apple Car Play, and Android Auto. The top of the line EX-L features all the previous goodies plus CVT (continuously variable transmission) leather trimmed seats, and navigation. These are just a few of the appointments the 2019 Honda Fit has to offer. Advanced safety features including automatic emergency braking and forward collision warning are now available on the Fit as part of the Honda Sensing package. Honda sensing is optional for LX and Sport trims and standard equipment for EX and EX-L trims. We invite you to the Olympia Auto Mall to experience the 2019 Honda Fit for yourself. The helpful staff at Capitol City Honda would love to arrange a test drive for you so you can see and fell first hand all the great features this car has to offer. We look forward to seeing you soon.